Found it! The coolest, smallest, and most reliable replacement charger for your 15" or 17" 85 Watt MacBook Pro Notebook. This 85W charger will even charge 45W and 60W MacBooks! **GUIDE ONLY** It is necessary that you check and verify which model of Apple computer or charger you have before purchasing. Controlled internally by a quad core processor, the Apple MacBook Magnetic Connector (1) Replacement Power Adapter automatically regulates voltage (power) to offer not only the safest charger, but also the most efficient for 85 watt laptops and their batteries. When we designed this replacement charger, it was made to seamlessly blend the highest-quality replacement charger with the coolest looking design on the market today. But we didn't stop there... when you purchase this Dynamic Power Mini-Charger you'll also get a 100% satisfaction guarantee. Love it or your money back. So go ahead! Grab yours today, and don't forget to stock up on a few different colors for your friends, co-workers and family members. They need a backup charger too! IMPORTANT: This replacement travel charger is made for use ONLY with 15" & 17" MacBook Pro and MacBook Pro/Retina Screen made BEFORE MID-2012. MAKE SURE this charger fits your laptop, check to see that your MacBook Pro was made BEFORE MID-2012 (see full fitment details below). This original Magnetic Connector (1) replacement charger was NOT designed for MacBook Pros made AFTER mid-2012. See our Magnetic Connector (2) listing if you need the newer Magnetic Connector power cord. 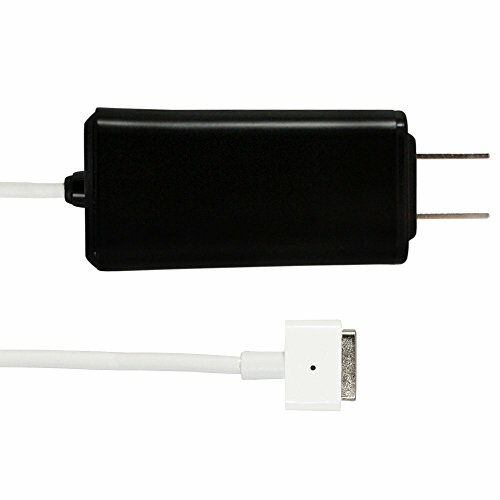 Smallest & Lightest Mini-Charger: Less than half the size of that huge, heavy white Apple brick charger you're lugging around in your laptop bag. You're going to love how convenient and portable this charger is at only 4 oz. and 3.1" long by 1.5" wide. AND this 85W charger will even charge 45W and 60W Macbooks! (Before mid-2012). Reliable & Safe: Get the most for your money. This adapter is UL, CE certified and engineered with Japanese components, pure copper heat sink, thermostabile/low ESR capacitors. Features: short-circuit protection, over-charge protection, over-current protection, and over-voltage protection, making this the safest, most efficient and reliable charger for your MacBook Pro. Don't make the mistake of buying a cheapo Chinese adapter; protect your investment with this Magnetic Connector charger! Express YOUR Style: There is nothing quite like YOUR MacBook. Why pay more for a plain ol' white brick from Apple when you can choose from 8 awesome colors? Apple people love performance and sleek form; finally there is a color to complement your style. 100% Satisfaction Guaranteed: When you purchase this adapter, you'll have the lightest & most efficient replacement travel charger on the market today! Don't believe it? We encourage you to try it for 30 days. Try it and love it, or your money back! Plus, a full 1-YEAR WARRANTY against manufacturer defects.